Tesla reported a surprise third-quarter profit on Wednesday. Tesla shares were up more than 10% ahead of Thursday’s opening bell. 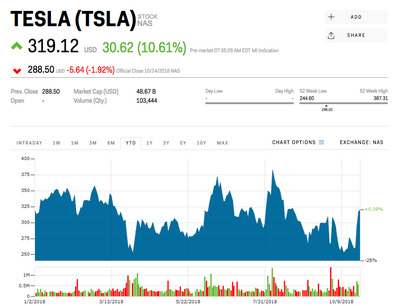 Tesla was flying ahead of Thursday’s opening bell after reporting third-quarter results that blew past Wall Street estimates in what the company described as a “truly historic” quarter. Shares of the electric-car maker were up more than 10%, trading at their highest level in about two months. After Wednesday’s close, Tesla reported adjusted earnings of $US2.90 a share on revenue of $US6.8 billion, better than the $US0.15-a-share loss and $US6.3 billion that analysts surveyed by Bloomberg were expecting. The company said free cash flow was $US881 million for the quarter, while its total long-term debt increased slightly, to $US9.67 billion. This year has been a roller-coaster ride for Tesla shareholders. The stock topped out above $US387 a share on August 7, the day CEO Elon Musk said he had “funding secured” to take Tesla private at $US420 a share. Musk didn’t have funding secured, and he later settled with the Securities and Exchange Commission, which had accused him of misleading the public. As part of the settlement, he agreed to step down as chairman for at least three years and pay a fine of $US20 million. But the damage had been done to Tesla’s stock, which fell near the key support level of $US250. The stock has managed to hold there, and it looks as if the bulls have reclaimed the upper hand – at least for the time being. Tesla was down 7% this year through Wednesday.